Water is one of the key traits every planet should possess to harbor life. However, some TRAPPIST-1 planets could have too much of it. If there is too much water inside a planet’s atmosphere, scientists could face various difficulties finding evidence of life, according to a new study dedicated to the planets orbiting the star TRAPPIST-1. The researchers studying the TRAPPIST-1 planets published their findings in the journal Nature Astronomy, and they report huge amounts of water on the star’s planets. Two of the planets have surfaces covered in water by more than 50%. This would make it extremely challenging for researchers to differentiate between biological life forms and geochemical signatures. TRAPPIST-1 is an M-type red dwarf star that is located at only 40 light years away from the sun. According to scientists, the star hosts seven planets that orbit it, while three of the planets are located in the habitable zone of the star. Scientists are happy to discover M dwarfs such as TRAPPIST-1 because it is believed to be the most common type of star to host planets with conditions for supporting extraterrestrial life in our galaxy. The researchers used estimates made on the masses of the TRAPPIST-1 planets in order to measure their densities. After that, they referred to a program that would help them determine what planetary components could be added together to fit those results. Planets with lower densities in the system suggested that there is water covering their surfaces. They discovered four planets that could harbor water, with two having less than 15% of water, while the other two were covered in water over more than half of their surface. Those wet planets are located in the habitable zone of TRAPPIST-1, meaning that at least a portion of that water should be present in the liquid state. 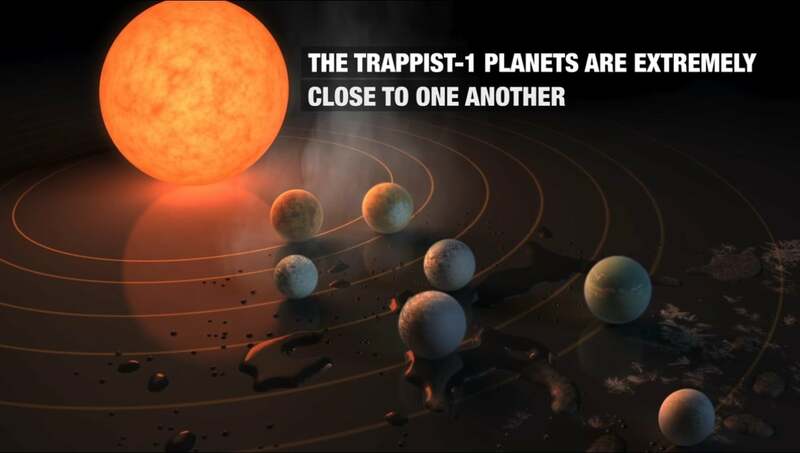 One of the authors of the study, an exogeologist at Arizona State University in Tempe, Cayman Unterborn, said, as per ScienceNews, that the liquid water located on one of the planets, TRAPPIST-1f, reaches down 125 miles deep, while there is about 1,400 miles of ice below that liquid water. However, the massive storage of water on TRAPPIST-1 planets could mean that extraterrestrial life could hardly flourish on them. The thick ice and water could mean that the planets would face difficulties regulating temperatures that would be acceptable for life. So much water could also make it impossible for carbon and other chemicals to move into oceans. Chemical building blocks like on Earth, such as carbon get deep into oceans thanks to the weather and erosion. If there is no land on other planets, scientists won’t be able to determine whether molecules in the water mean that there is a sign of life. As to geological activity on the planet, “the vast majority of data that’s out there is for one planet, and it’s ours,” Unterborn told ScienceNews.